This is for those of you that use Garmin Edge devices on your bikes. If you’ve used your device for a while and are anything like me, you probably have a love/hate relationship with your device. When it’s working properly, it’s just awesome. For the numbers geek in me, I can see all kinds of useless stats (as well as a few useful ones), for the guy who likes to plan complex routes always finding new roads to ride on, it can direct me to where I want to go, and for the ride history obsessive person I am, it lets me upload my rides to Strava to see how I am doing (if you’re really a numbers / visualization obsessive person, check out VeloViewer, a Strava add on – I love it, also, Relive is very cool). For two of the above three things, my Garmins pretty much never fail me. For navigating though, sometimes I (and I assume most of you) get really frustrated. Caren and I run two Garmins on our bike. Right now, I have an Edge 1000 and Caren has an Edge 800. I build all of my routes on RideWithGPS. I really think they have, by far, the best ride mapping software on the web. I download the TCX file for both units. Same exact route and yet the turn by turn prompts aren’t always the same. It can get very confusing, and my experience shows that once you go off course, even after regaining the course, the turn by turn prompts are often broken (especially on the 1000). For touring, and as a tour operator, this can really be an issue. Many people no longer like to use cue sheets and rely completely on their Garmins. This includes me and Caren. The method we use to deal with this to leave the Garmin display on the map and just follow the line. The cue prompts are great, but if they should fail, following the line always works. To become even somewhat happy with your Garmin, you need to have it set up correctly. I could reiterate all that info here, but there are tons of articles on the web about it already. For any model, make sure to turn off the recalculate option. If you don’t and you go off course, the device may just recalculate a direct route to the end of your course ignoring how you really want to get there. For the Edge 800, you have to set “Turn Guidance” on each time you load a course if you want navigation prompts. I personally think this is really dumb and this is the only model that you have to do it on. Click here to find the RIdeWithGPS pages with specific instructions for your device. The links also describe which type of file to use for each device. According to most information out there, the TCX is usually best on most newer devices. For the 5xx, 8xx, 1xxx and touring models, the newly available FIT files are the best ones to load onto your device. 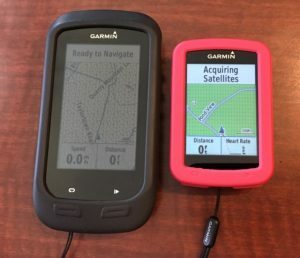 To load a course onto your device, attach it to your computer with a USB cable and download the file into the /Garmin/NewFiles directory. Beware that not all USB cables are the same, and the Garmins seem to be sensitive to that. My 1000 will only attach to my computer properly if I use a “good” cable. If you use “not-good” cable, the device just turns on and starts charging, but does not attach as a drive. Some Garmins have a micro SD card in them to store the map file. You can place your route file (TCX or GPX) in the /Garmin/NewFiles directory on the card or on the main unit. If you place it on the card, when you look at the routes on the Courses list, the ones on the card will be prefixed with “SD”. “You are near the beginning of your course. Do you want to start navigating?” – I used to answer No to this all the time, but I recently changed to always answering Yes. When I used to answer No, I was sometimes getting an issue when riding a loop course where the Garmin would think I was finished before I even started. Since I started answering Yes to this, I have not gotten this issue once. You probably bought your Garmin with a set of US maps on it. This is the “base map” that your route will show on. If you are going outside the US, you will need some new maps. You can find out more on this here.